Gas prices have spiked yet again and are now up about 24 cents a gallon since Hurricane Harvey struck Texas. The national average price for a gallon of regular jumped nearly 7 cents to $2.59 a gallon on Saturday, according to AAA. In Texas, where Harvey devastated the Gulf Coast and shuttered refineries, the average gas price has jumped 17 cents since Thursday. Prices in Texas spiked 10 cents on Friday and another 7 cents on Saturday. And price spikes are even more severe in some other Southern states. North Carolina prices jumped 9 cents overnight and are up 34 cents over the last week. Georgia prices jumped nearly 12 cents overnight and are up about 38 cents for the week. And it's not just the south. New Jersey gas was up nearly 13 cents overnight, and 30 cents since last week. Gas futures shot up more than 10% Thursday, the last day of trading for contracts that promised September delivery of gasoline. Prices for the October futures early Friday were slightly lower, suggesting traders don't expect the higher prices to last. But there will likely be continued pain at the pump as refineries along the Texas Gulf Coast struggle to get back online. "There's a worry now that most of the Texas refineries could be compromised for weeks rather than days" said Kloza. He said the national average could get as high as $2.75 a gallon in a worst case scenario. Some refineries along the Texas Gulf Coast are in the process of coming back online, Kloza said, particularly in the Corpus Christi area. But he said it'll be mid to late September before it will all be up and running. "Restarting a refinery is not like restarting a car. It's more like restarting a lawn mower that has been sitting in a shed for a number of years," he said. "There's a lot of things that could be wrong." Nearly 30% of the nation's refining capacity along the Gulf Coast has been shut or reduced operations due to flood waters associated with the storm. Motiva's massive Port Arthur refinery, the largest in the U.S., shut down on Wednesday due to "increasing local flood conditions," while Valero (VLO) also closed its Port Arthur refinery on Wednesday. 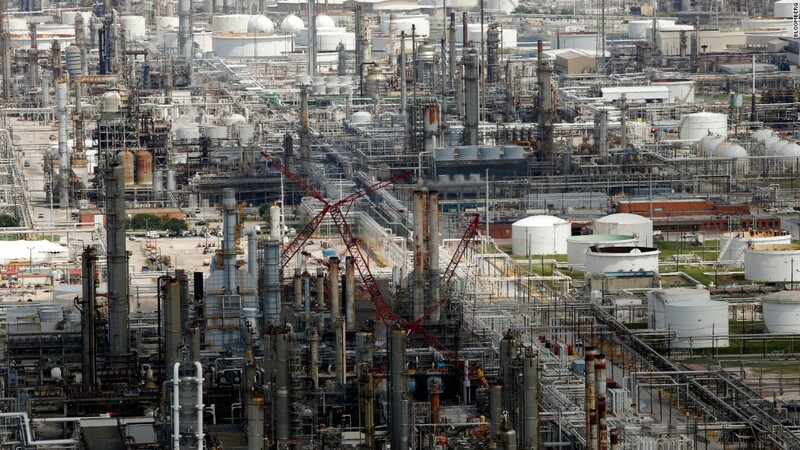 Earlier in the week ExxonMobil's (XOM) Baytown Texas refinery, which is the second-largest in the country, was shut down due to roof damage caused by heavy rain. The refinery shutdowns caused the Colonial Pipeline to shut part of its operation from the Texas Gulf Coast early Thursday because it doesn't have enough product to move through the pipeline. The pipeline is key to moving gasoline, jet fuel and other refined products to points along the East Coast from Florida to New Jersey. A break in the same pipeline in September 2016 caused gasoline shortages and prices to spike about 20 cents a gallon in Alabama, Georgia, North Carolina, South Carolina, Tennessee and Virginia.